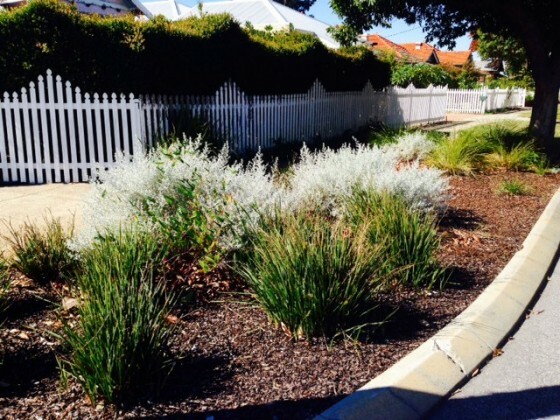 Garden verges already enhance our streetscapes. At the end of March, City of Bayswater Councillor Chris Cornish put forward three motions to Council aimed at making the City the true “Garden City” it proclaims to be (see Chris’s original blog post, Edible Gardens, for the details and a recent article in The Voice about the outcome of the vote here). Of the three motions, the one allowing residents to plant veges on their verges appears to have captured the most attention and support, with Council now to investigate the development of a policy for those residents wishing to convert a corner of their local park or verge into vege patches. Surely veges and plants are better than this? 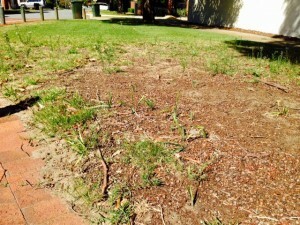 From a policy perspective, I don’t see how growing veges on verges would be that different from the Council’s current policy on verge gardens, which already allow for low groundcovers and shrubs not exceeding 75cm to be grown. Just insert the words “or vegetables” after shrubs (or even simpler, change the word shrubs to plants) and voila, you have a policy! 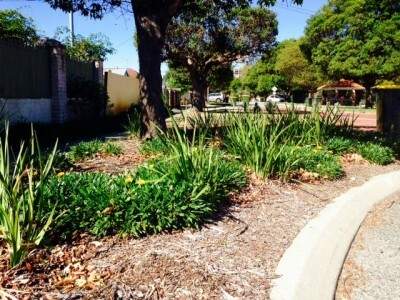 (To see the current policy click here – it’s under the section headed “Parks & Gardens – Street Verges”). Containers, structures and stakes are already banned from verges (note that some Australian councils take a more progressive approach to this with guidelines provided for certain structures to better facilitate growing of veges) and there are already provisions for setbacks for pedestrian access if no footpath exists – so what more is there to do really?! I love the idea of community adopted garden spaces and verge gardens, be they productive ones with vegetables, environmentally friendly native plant ones, just pretty flowering ones like the pic above or a combination of all three. 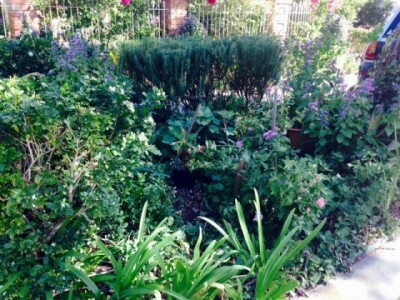 When we converted the front garden of an Inglewood home we owned into a vege patch the amount of attention it attracted from passers by was terrific – it was a great way to meet and get to know our neighbours, not to mention the free produce swapping benefits that came with it (fresh parsley for a bag of lemons? sure!). Let’s hope that Chris’ vision and support for a greener City doesn’t get diminished by a bureaucratic need to overcomplicate things – they’re just plants after all! And if successful, how good would it be if the Cities of Stirling & Vincent decided to get in on the act too?! You can check out the City of Stirling verge guidelines here and the City of Vincent adopt a verge program here (sadly, no veges currently mentioned on either) and if you’re interesting in knowing more about the possibilities for verge gardens, including how we might safely allow certain structures to aid with production and limit water run off, check out this fantastic resource developed by the Australian City Farms and Community Garden Network here. You’ve hit the nail on the head – let’s hope the “vision and support for a greener City doesn’t get diminished by a bureaucratic need to overcomplicate things”. The whole point to the motions was to have a blanket approval process free of red tape and restrictive rules. The success hinges on that in fact.